Get ready to discover the true definition of shine. Black is a high-tech wax specifically designed to enhance the depth and shine of black paintwork. Utilizing state-of-the-art technology, Black takes your dark colored paintwork to the next level. The patented Chemical Guys Color Enhancing Technology™ allows Black to take your shine to the highest level of perfection. Our proprietary manufacturing method utilizes a patented cold emulsion process to give Black the deepest shine possible. The unique cold emulsion process allows Black to be created with zero heat, keeping the protective super polymers in their strongest molecular state. Using advanced super polymers that repel airborne pollutants, water, and ultraviolet radiation, Black provides a deep shine that is guaranteed to impress any enthusiast. The unique wax uses synthetic polymers that bond to the surface creating a durable shield of protection. The Chemical Guys research and development team spent countless hours creating synthetic super polymers that leave a slick, non-stick surface that repels contaminates and makes black and dark paintwork actually look darker and with more shine. Black will truly show you how bright your dark colored paintwork can shine. Protecting your black and dark colored paintwork is important. Black paintwork often fades and discolors when exposed to harsh UV solar rays. Chemical Guys designed Black with high-tech UV protection that prevents discoloration by reflection light and preserving your vehicle’s finish. The super polymers bond to the surface creating a protective layer that fights off the harshest elements while maintaining a deep shine. Black creates a non-stick layer that repels water and contamination making washing your car faster and easier. Water simply slides off the surface reducing drying time. Black was engineered to apply quickly and easily by hand or machine. The unique texture of Black applies thin to the surface reducing the effort required for removal. Chemical Guys combines show-winning style with industry leading innovations to bring you a wax that will let your black paintwork shine! Black is formulated to protect your dark colored paintwork all year round. Let's face it, people own black vehicles because when they're clean, nothing looks better. Black paintwork however is notorious for being the hardest color to keep clean. Chemical Guys Black keeps dark colored cars, trucks, and motorcycles looking amazing all year round. It protects black paintwork from water spots, staining, and contamination keeping your dark colored paintwork looking as classy and elegant as the day it was created. The advanced super polymers built into the formula allow the surface to become hydrophobic and repel water. The extreme durability of Black gives you the ability to keep your dark colored paintwork in pristine condition all year round. Durability is the key when choosing the correct protection for your vehicle. Black is designed with high-tech UV protection to ensure your dark colored paintwork doesn't become faded or discolored. Over time, the sun’s powerful UV rays can fade and discolor your black paintwork giving a dull and neglected appearance to your vehicle. Makes sure your dark colored paintwork stays dark forever with the extreme durability of BLACK. Black is one of the most popular color choices for automobiles today. The color black portrays elegance, class, and style. Chemical Guys developed Black to make your dark paintwork shine. The unique synthetic super polymers allow black and dark colored paintwork to have a crisp bright shine that really stands out in the sun. Black and dark colored paintwork require a special formula to provide the maximum level of depth. Black was engineered with our patented Color Enhancing Technology. This state-of-the-art color enhancer allows dark colored paintwork to produce crystal clear reflections of blue skies, orange sunsets, and green forest scenery. The advanced Black formula allows your black and dark colored paintwork to act like a mirror that reflects color with depth and clarity. Just one coat of Black will let your dark colored paintwork shine bright in the sun and have that brilliant reflection at night. Black takes your paintwork to the next level of elegance. 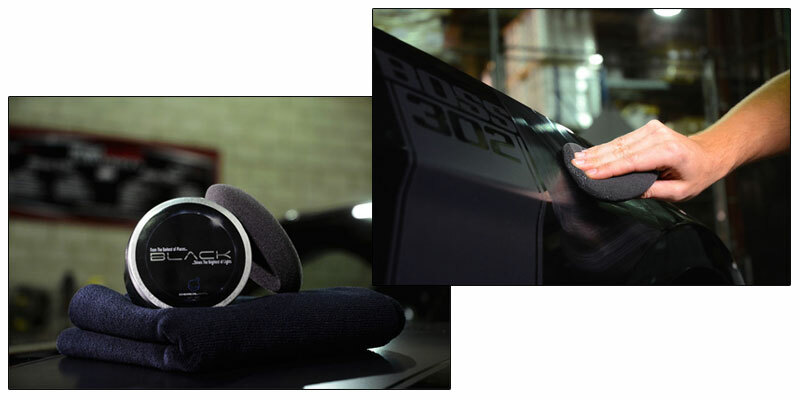 Chemical Guys developed Color Enhancing Technology® to expand the clarity of automotive paintwork. This advanced formula allows the true color tone of your vehicle to shine in any situation. Countless hours of development and testing went into this formula before releasing it to the public so we could insure that Black would be able to take shine and color to the next level. The unique technology magnifies the appearance of the paintwork for a true high definition color experience. Chemical Guys formulated Black to magnify and enhance metallic flake allowing your paintwork to sparkle in the sun and shimmer in the moonlight. 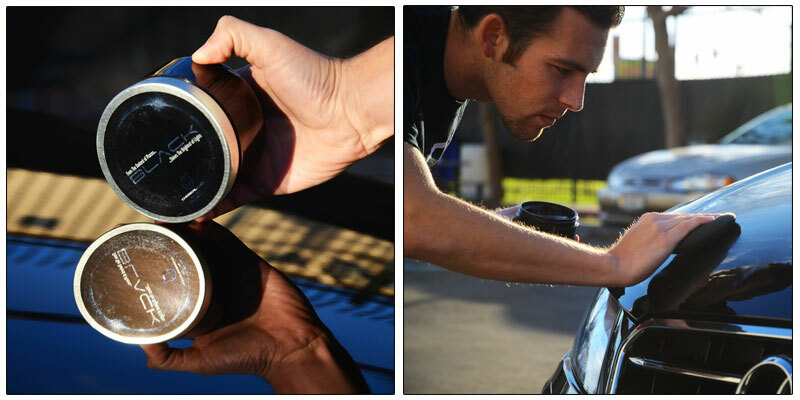 Black turns waxing your car, truck, or motorcycle into a magical experience. The high-gloss finish of Black really attracts attention by reflecting light in a unique way. Black is sure to impress all the car show judges giving your paintwork an appearance that any car enthusiasts can appreciate. Chemical Guys uses the highest level of technology to give detailing professionals and enthusiast the greatest car care experience possible. Traditional paste wax products are known for being extremely difficult to apply and even most challenging to remove. A traditional paste wax needs to be melted onto the applicator pad to ensure a smooth, thin coat on the surface. Black takes all these difficult challenges and sends them running for cover. The advanced formulation of Black allows for an application so easy it makes waxing your car fun! The semi-solid texture of Black allows the user to apply the thinnest coat possible achieving the highest level of epic shine. Removing Black is even easier! Simply remove Black with a few easy swipes of a quality microfiber towel to expose the true radiant beauty underneath. Applying Black is so quick and easy, anyone can do it!